← Why not take the Magic Carpet Ride? Everything I know I learned on the toilet? Okay, I am going to take you somewhere today that you may find uncomfortable; however, please go with me. It might conjure up some stinkin’ thinkin’. Recent fate, and outright necessity, has given me the opportunity to visit some bathrooms of friends who are in the process of potty training their young children. While using these facilities I noticed there are childrens’ books all around, which I assume were being used to keep the child on the potty chair a little longer…to increase the chances for success, you might say. So my own primary research will have to be enough to substantiate my claim that most bathrooms do have some type of literature available for potty patrons. All this makes me think that the apparent wide-spread habit of adults reading “on the go” could be traced back to our early days of potty training. After all, how else would we have learned that the bathroom could be a pretty good place to read? It is relatively quiet, no one else will want to interrupt you, and it could be considered a productive form of multi-tasking. With so much knowledge found in books, magazines and even newspapers, our privies seem like a great place to wipe away our ignorance. I am guessing that you are a member of the literary latrine society. Come on, admit it. 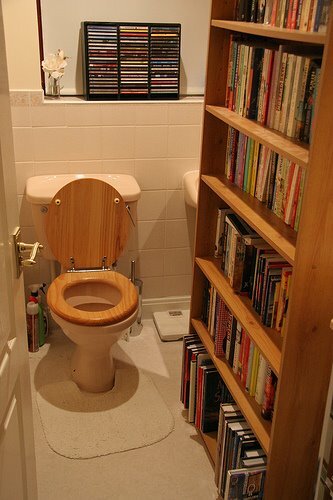 Come out of the proverbial water closet – I bet you have a habit of reading while in the loo, too. Habits are those things we do daily at a sub-conscious level, with little to no thinking involved. Habits are things we are trained to do, or train ourselves to do, by doing them over and over again. But I never really stopped to think why I read in the bathroom; do you? What other things do I do on a daily basis without thinking? How does that affect my day? What if I stopped doing so many things habitually? What if I began bringing more things to the forefront of my mind and questioned why I do them? What would change? What could be better? Would it change the outcomes of my daily performance? Taking this even further, I consider attitudes to be “habits of thought” and this brings even more questions. If I thought more about what I am habitually thinking, would it change how I treat other people? How I approach my work? How I treat the clerk who waits on me at the coffee shop? Everyone I come in contact with on a daily basis? And what about those skills you are still trying to learn or at least improve? What if we took a bit more time with our efforts? What if we found incentives that would keep us positioned a little while longer for a chance at success? Think about your habits of behavior, your habits of thought, the things you usually do and say without thinking, and the new skills you need or want to learn. Take time to think a bit, maybe read a bit, maybe sit a bit longer, and you might just develop some new attitudes, skills and habits that will change your life for the better. …and it all started when you were just 2 years old, sitting on the pot, trying to stay just a little longer to learn an important skill that really would change your life forever – and for the better. This entry was posted in attitude, habits, learning, literature, reading, toilet training. Bookmark the permalink.